Very interesting results! Thanks for the write up. It would also be interesting to order your SQL query on CustomerKey to see if that helps improve compression (and consequently query performance). Thanks for the comment. I’m already sorting the source data by CustomerKey. I’ve tried with and without the sorting and didn’t notice any difference with this data set. I’ve also been running tests on the NUMA affinitization over the last couple of days, with some more interesting results – I’ll post the summary here later. 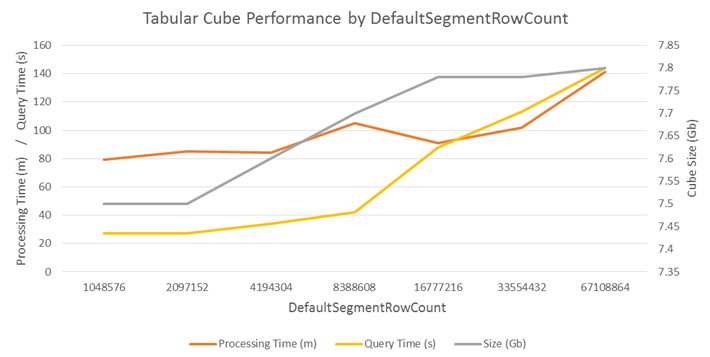 I’ve added a new post with the NUMA test results (https://www.purplefrogsystems.com/blog/2013/12/ssas-tabular-numa-and-cpu-cores-performance/). Ok so the NUMA nodes tests I did were slightly flawed – updated results here (https://www.purplefrogsystems.com/blog/2014/02/ssas-tabular-performance-numa-update/). However even on the new tests I still found the best performance was using DefaultSegmentRowCount of 2m and 4m. Maybe it’s just the specific test queries I’m running (entirely distinct count based) and the very high cardinality of the data I’m using. I have a complex report, and changing from 16m segment size to 2m let the report run in 1/3 the time. MASSIVE reduction. The larger segment size had seemed better on a single calculation. However, this is perhaps related to distinctCount specifically? My calcs are using it quite extensively, the calc that showed better performance at larger segment size was not. The DISTINCTCOUNT measure improved in a significative way especially if the number of distinct values in a column is large (more than 1-2 million). This might have an impact on segment size, because a larger segment usually improve compression and performance, but you might have observed a strange situation because of the previous DISTINCTCOUNT performance issue. Funny you should mention that… That bug was found and fixed as a direct result of working with Microsoft support on this series of tests, whilst investigating the slow performance. That fix definately does help distinct count queries where each individual result cell exceeds a value of 2m, unfortunately it doesn’t improve anything if your result cells are <2m. I did perform some brief testing on CU8 + the hotfix, and the optimal segment was still 2m in my data set. However, if you have 32 cores available, you should have at least 32 segments (Vertipaq uses one thread per segment). Looking at the cart in more detail, it’s “strange” that the size of the database increase with larger segments – but this might be related to the high number of distinct values you have in the CustomerKey column (80m) and to the distribution of other data in other segments. We have worked on a 4billion-row fact table where the larger dimension was much smaller (100k rows) and in that case the white paper indications work well. The problem is that every database is different and parameters might vary depending on distribution of data. BTW: have you tried processing the data using a particular sort order? I don’t think it would be beneficial for a 1:2 ratio between customers-transaction rows (1 Customer – 2 Transactions), but it could be useful to know the result if you tested it. The source query for this did have the data sorted by the distinct count key, but I’m afraid I’ve not got any test results with it sorted any other way. I’d heard that sorting could make a difference (thanks to some helpful pointers from Mark Stacey), so I applied the sort before I started any meaningful testing. If I can get time on the MTC test server, I’ll test different segment sizes again to see if the results change. The problem is too many tests to run, not enough time to do it! Just a comment on sort order: in my tests I see differences in resultant size, but at least for the distinct count tests (where I’ve been focusing), I haven’t seen what I’d consider significant query speed differences. I was making some testing over a distinct count measure on SSAS 2012 with latest Cumulative Update build 12.0.4427.24. I created two test measures, one using a distinct count and another using a SUMX over a DISTINCT Set of values and adding 1. Does anyone knows if this is an expected behavior? Can it be because of SegmentSize / Compression / fragmentation? I’m stating with this tabular cubes and I need to find out what are my hardware needs to run the server, and also i need to know how to troubleshot performances issues, does any of you know a good link or document that i can read? also a tool to figure out some metrics of the analysis server? You might take a look at this article about hardware selection for SSAS Tabular.